Demi Moore and Ashton Kutcher spent Yom Kippur day on a Kabbalah camping retreat at Cachuma Lake in an attempt to rebuild their marriage. RadarOnline reported that Ashton Kutcher apologized for his behavior to Demi Moore on Yom Kippur, the holy day of atonement for Jews. Ashton Kutcher, 33, allegedly asked for the chance to make amends for cheating on his 48-year-old wife Demi Moore with younger Sara Leal on the morning of their sixth anniversary at the end of September. It was the first time actors have been seen together in the last months, and since news broke of Ashton Kutcher had an alcohol-fuelled hot tub party awash with women, including 23-year-old Sara Leal. 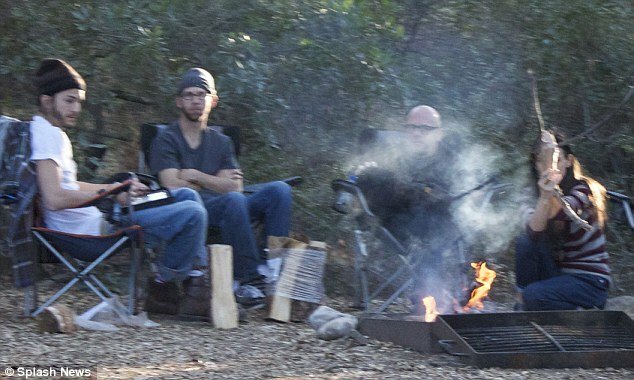 Demi Moore and Ashton Kutcher had wanted their meeting at Cachuma Lake in Santa Barbara, California on Sunday to remain a secret, but a fellow camper captured a photograph of them sitting around a campfire with two other companions. Demi Moore was wearing a Kabbalah red string bracelet on her left wrist, which is meant to bring good fortune and protect against an “evil eye”. Demi Moore and Ashton Kutcher are being counselled by members of the Kabbalah faith, which is a controversial offshoot of Judaism. Madonna and other celebrities like Roseanne Barr, Britney Spears, Rosie O’Donnell, Lindsay Lohan and Naomi Campbell have also been associated with Kabbalah religion. Demi Moore and Ashton Kutcher turned to the Kabbalah religion seven weeks ago and signed up to its counselling service in order to save their marriage.